Remember this pretty spring sweater? I told you I’d be wearing the Snap Pea color soon and here it is! Isn’t it a lovely shade of green? And the linen/rayon combination makes such a cool texture! I’m still on my spring break and enjoying every moment of it! I wore this look for coffee and shopping with my buddy Rachel at Santana Row, a fabulous local hangout perfect for girl time. A big thanks to Rachel for playing photographer and always being such good sport about it. I’m so lucky to have so many amazing girlfriends. One of my very fav things about time off is getting to spend time with them! Unfortunately this pretty kimono is no longer available, but I’m linking up a few chic ones that I’m loving. Everything else is available and don’t forget you can take 20% off when you shop Jambu.com with code FASHION18. Disclosure: some of the items I’m wearing were gifts from brands. All styling and opinions are all my own. I’m featuring another spring green kimono-wearing babe, Cheryl of Cheryl Shops. Dolls, I can’t wait to see what you’re wearing this week! I always look forward to checking out your looks and thanks so much for sharing your style with the Fun Fashion Friday link up party! Absolutely love this look! That kimono is fabulous on you! Kimono CUTIE who styles Spring so spot on!!! Enjoy the rest of your week sweet friend! Love that spring green! And that kimono!! I love everything about this post. You look so laid back, chic and collected. Love the shoes, the bag, the kimono! Love! You always put together the best outfits, Dawn!! Love your outfit! You (or your lovely friends!) always take beautiful photos! Love San Jose. From your “Southern Cal” friend, and former English teacher! Oh, how I love that kimono! Great outfit, Dawn Lucy! I love the green and that kimono is spectacular! Have a super weekend! I love your outfit! Perfect for Spring! That kimono is super cute! These pictures in the street are fabulous! I love your look too. Such perfect spring captures! Thanks Hon! It’s so nice when I have someone to play photographer for me! This coat is nice for the still chilly mornings and evenings in spring. Great styling. Oh, hello there! Thank you so much for the feature! I was thinking about how much I love your kimono (and your sandals!) and then there I am! 🙂 I am also cohosting a linkup today—please stop by and share this fabulous look if you can! I linked up! Thanks for inviting me. 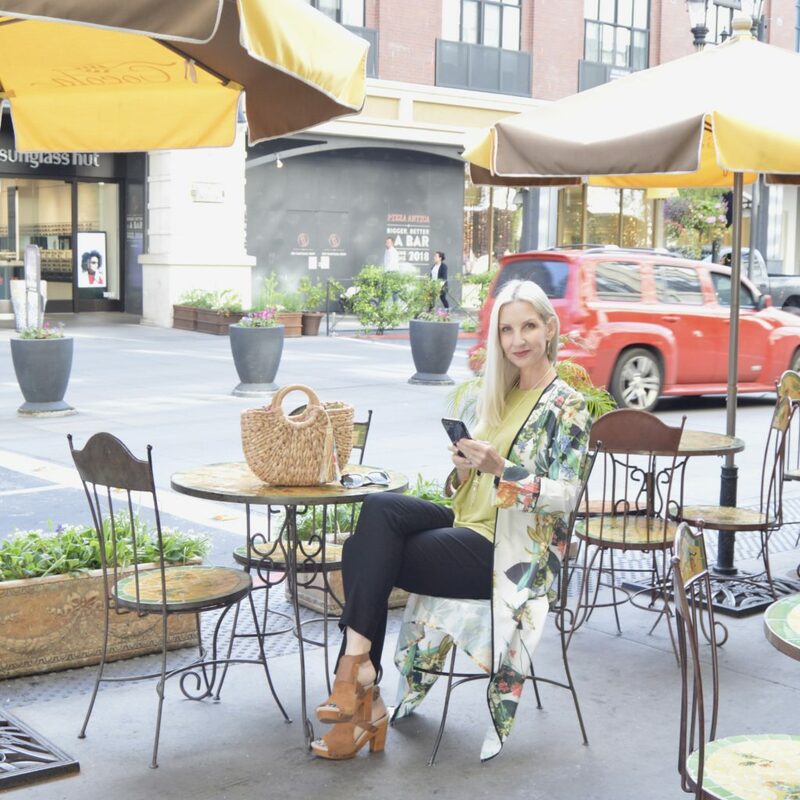 Love your kimono outfit … and was happy to feature you! Loving every single piece of this spring outfit! Now I want it all, haha! 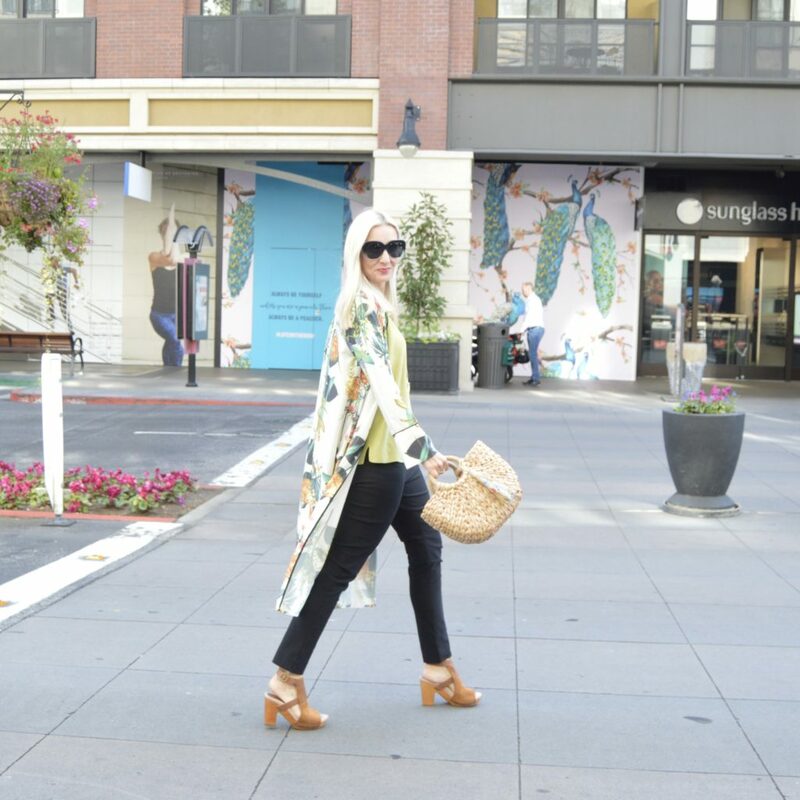 Love the snap pea color top you styled with your kimono. Not everyone can wear that color but you do it so well! You look amazing in that kimono! I saw a yellow one similar to that today at Nordstrom.You wear it beautifully! What a fabulous Kimono! I love the sunshine vibe and fabulous straw bag, too. Happy new week! That kimono is so pretty. I love the length. You look stunning in this outfit. I love the colors and the kimono and bag are fabulous.